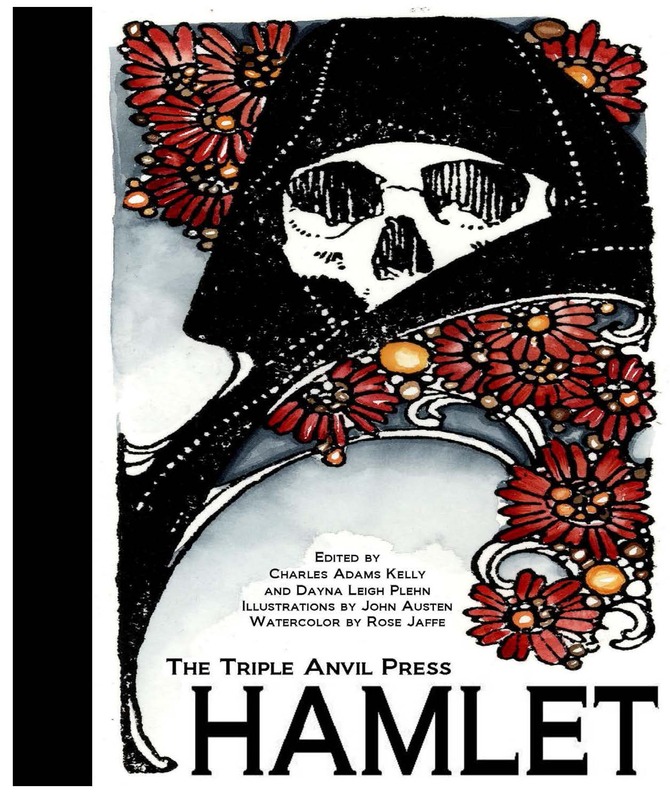 For over two years, the publishers of The Triple Anvil Press HAMLET have held a collection of over 20 watercolor images fromHamlet. The images were based on century-old vignette sized woodcuts by John Austen with watercolor work by Rose Jaffe. In 2013, the editors “extracted” the narrative of Claudius from the 4000-line text of Hamletand published a few of the illustrations in The Brief Reign and Death of King Claudius, a play within the text of Shakespeare’s HAMLET. From among the 5600 books from 34 countries entered in the Independent Publishers annual awards, The Brief Reignwas one of nine designated “Outstanding Book of the Year.” One of these watercolor vignettes appears at the beginning of each scene in this edition. In a century of private press editions, featuring the work of talented artists, many have no introductory notes on their texts. This is curious because Hamlet has come down to us in the form of three texts, two of which form the basis of most editions, including their many textual variants. The publishers of this edition of Hamlet determined that they would not produce an edition without a significant text. The text in most modern editions is a primarily a conflation of two texts: the text of the 2nd Quarto (Q2) of 1604/5 and the text that appears in the First Folio (F) of 1623. The Howland editors have charted 288 words that are variant between these two texts, words that are in lines that are otherwise identical. The editors of nine respected editions do not agree on 158 of these variant words, and the range of Q2 choices is from almost 90% (Riverside) to less than 10% (Oxford). Some editors favor Q2 choices on the basis that the Q2 text might be closer to Shakespeare’s manuscript, while others favor Folio choices, believing them to be closer to the text as acted. Recognizing that each Q2 vs. Folio variant could be authorial, an alteration by the players, a mistake by a scribe, or an oversight by a compositor, the Howland Research editors are descriptionists rather than proscriptionists, focusing on context as the primary determinant of each choice. The result is a more even split between Q2 and Folio choices for the critical 158 words. For readers interested in the complete analysis and rationale for each choice, the editors have prepared a companion publication, The Howland Research Text of HAMLET, which includes the rationale for each choice in the Howland text and charts showing how each of the selected variant words appears in Q1, Q2, the Folio text, the Howland Research text, and each of the nine respected editions consulted. List price $250.00. Enter coupon code ac-taphamlet to receive the academic/educator’s price of $180.00.